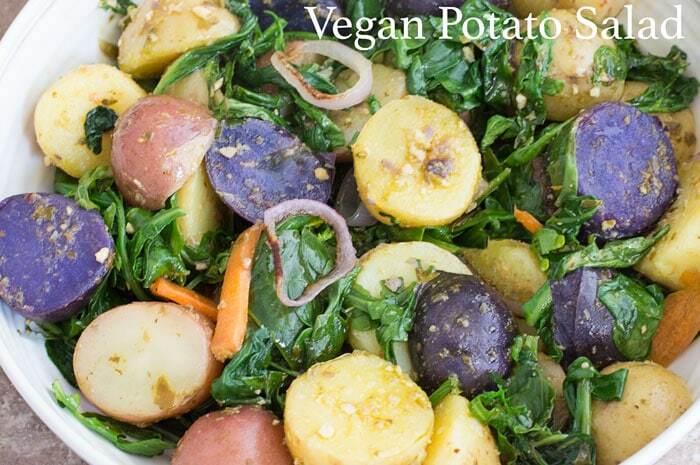 Vegan Potato salad is so easy to make. In just under 45 minutes, you will have this perfect dish. It is no secret that I am attracted to bright colors. When I saw some colorful potatoes in the grocery aisle, I was like a moth to flame. 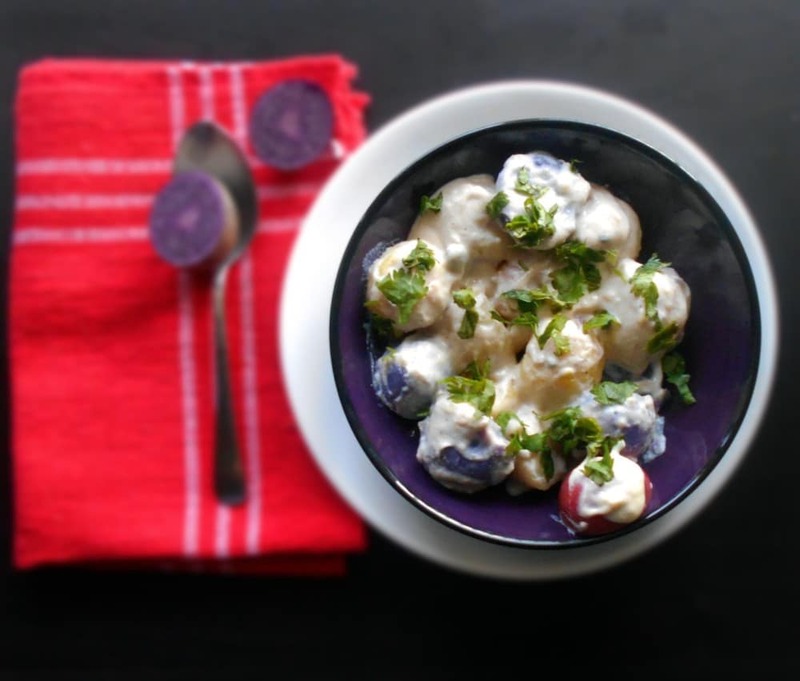 A vegan potato salad recipe immediately leaped in my mind. 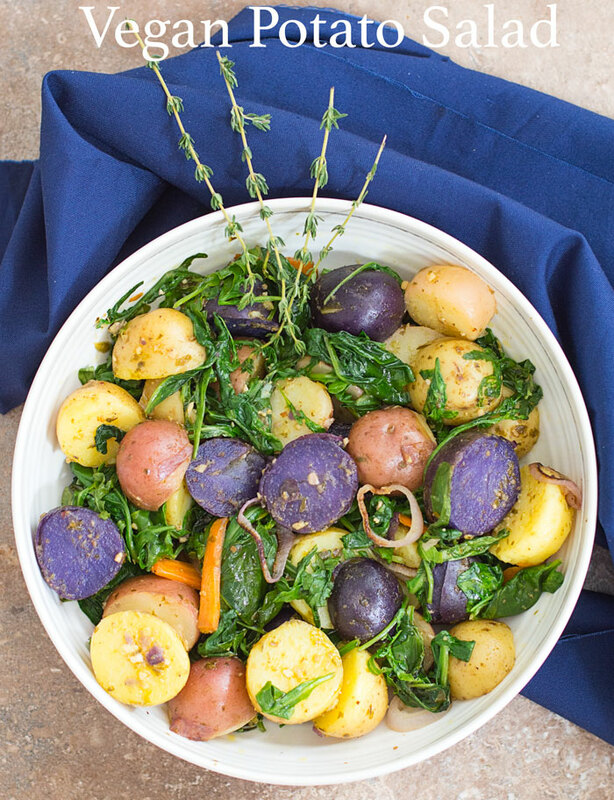 A potato salad is not a potato salad until it has some color in it. For this recipe, I went with Pesto instead of using the traditional mayo. You can use your favorite basil pesto recipe or try my vegan arugula pesto recipe. The pesto makes this salad very flavorful and it works so well with the sauteed greens. It does have arugula in it just like the pesto. 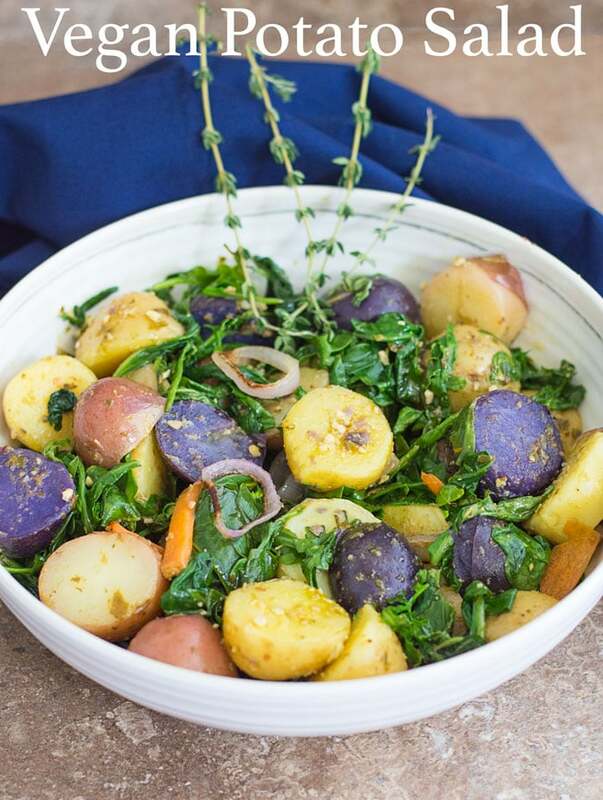 However, all the arugula works really well together with the potatoes and other greens. I have to stop for and admire the potatoes. Just look at how colorful these tiny potatoes are!!! If you are looking for comfort food, then this is perfect for that occasion. It is such a quick and easy recipe that anyone can make it. Are you looking for tips on how to bake a sweet potato? Read my 5 quick and easy tips on how to bake the perfect sweet potato. 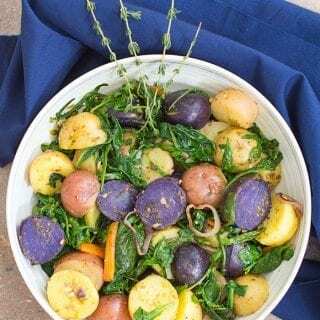 What is your favorite potato recipe for cookouts? Occasionally, I will revisit previous recipes and do a makeover on them. You probably came to this page based on this photo. It was made with vegan mayo. However, I decided to re-vamp the recipe and bring you the new version you see above. I think you will like. If using the salt, add it now. Stir fry on medium heat for only 2 minutes. Thank you, Prash! I like the recipe. Would love to see what you make with your vegan mayo! Vegan mayo…While I am not vegan, or a vegetarian, the mayo content in salads of this nature often disagree with me because of my gastric bypass. I miss eating them (although I shouldn’t eat them anyways because carbs are a no-no), I think I am going to have to give this a try. Thanks.